So since I’m unemployed now, I took the time to make a normal-ish breakfast today. (Okay really, the milk was expired so I had to abandon all hope for a bowl of cereal). Make pancake mix according to directions (add water). Mix in raisins. Heat pan until water drops almost sizzle off immediately. If desired, coat pan with thin layer of butter. Pour pancakes in pan (whatever size or shape you want) and after about 2 minutes, or the bottom can have a spatula go under it cleanly, flip over. Make sure to pour the raisins into the pancakes, they tend to stay at the bottom of the mixing bowl. Once the pancakes are done, spread a thin thin layer of pumpkin butter on top (no syrup needed!) and decorate as desired. I know, the face pancake looks really creepy, like a gorilla almost. I couldn’t find any curvy peices for the mouth and the straight mouth looks …creepy. 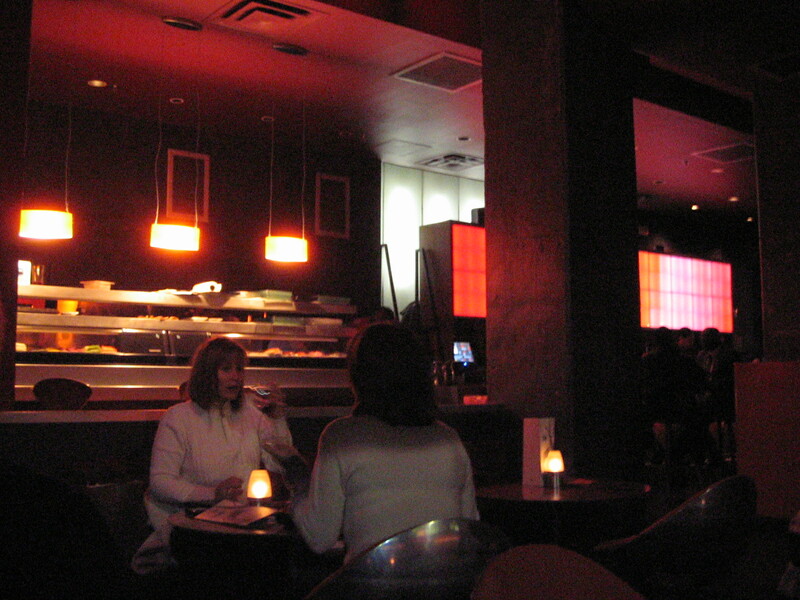 For Valentine’s Day 2009, We went to SEI in Penn Quarter. I learned about SEI opening via the Washingtonian and after eating in Penn Quarter one day, happened to actually see the restaurant. I was very excited about going here because I had found this gem and followed up with it. Not only that, but my eagerness to visit this restaurant had resulted in my beau recommending this to his co-worker, who raved about it (of course, no credit given to me). SEI is owned by the same people that own Oya, one of my favourite restaurants in DC. The great thing about Oya is that it is a sure-fire thing. If you love food, there’s bound to be something there for you. 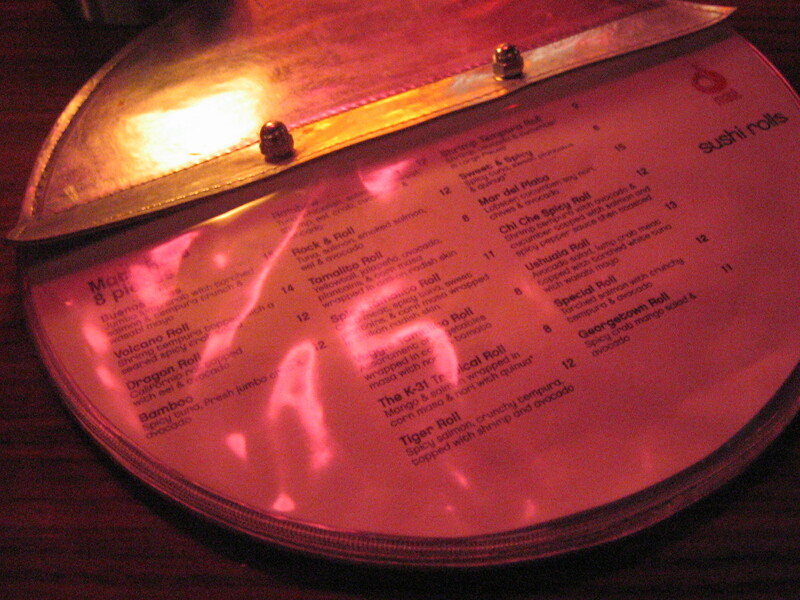 I’ve had great fusion sushi there, escargot, and they also make good drinks. Oya actually introduced me to restaurant week a few years back, and I’ll always hold a soft spot in my heart for the chains-fireplace-waterfall-crocodile skin combo. First off, we were seated right by the door. Not even next to the door, we were seated in the inbetween-the-lounge-and-dining-area section that required everyone to walk by us, a cold breeze to pass us each time the door was opened, and I had to stare at a bunch of hosts that stood hovering at our table scanning the restaurant for tables. I asked to be moved to another location, (there were plenty of tables open), and they tried to move us right next to the kitchen/cashier. We opted for the less noisy, but still annoying, original location. It was hard for me to focus on the meal since I was still irked by the service (or lack thereof), but I looked at the menu. All of the drinks sounded like they could either be good or bad, so I didn’t try any. They were supposed to be “Japanese” cocktails, but they were just… not. In fact, after the whole meal, I felt like this restaurant was trying to call itself Japanese by having each dish have either green tea, soy sauce, wasabi, or sake in it. But we’ll get to that later. 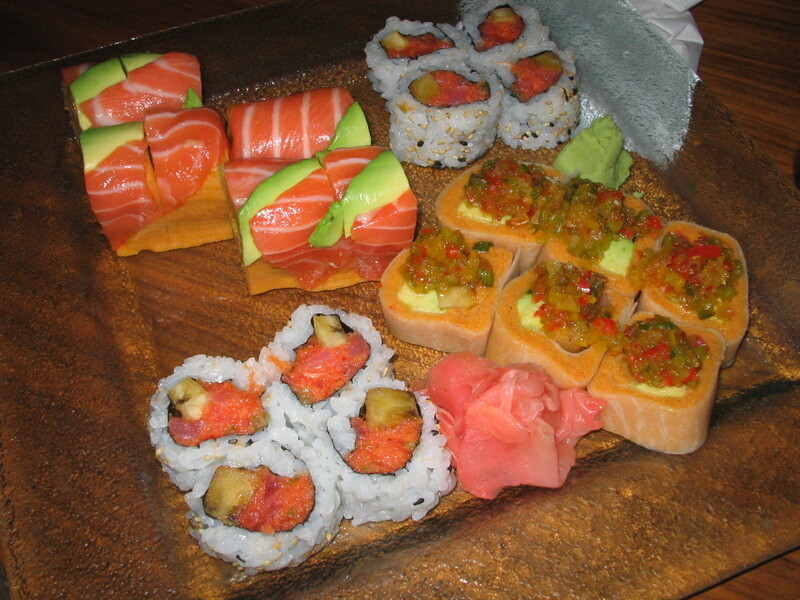 We had a Fish and Chips roll, Kobe beef roll, Spicy Salmon Mousse, and Shrimp Tempura roll for the sushi. All of them were just okay. I was weighing in my mind “Should I go through the effort to chew this and deal with my ever-present fear of choking to death?”, and the sushi was not worth the risk of death. I had to cut the Kobe beef roll in half to even eat it. The beef was very chewy, okay tasting, but nothing special. (I’d rather have that course at Minibar that’s raw Wagyu!!). The spicy salmon was a sushi that I had campaigned for, trying to convince Danny to order it, and I ended up hating it. 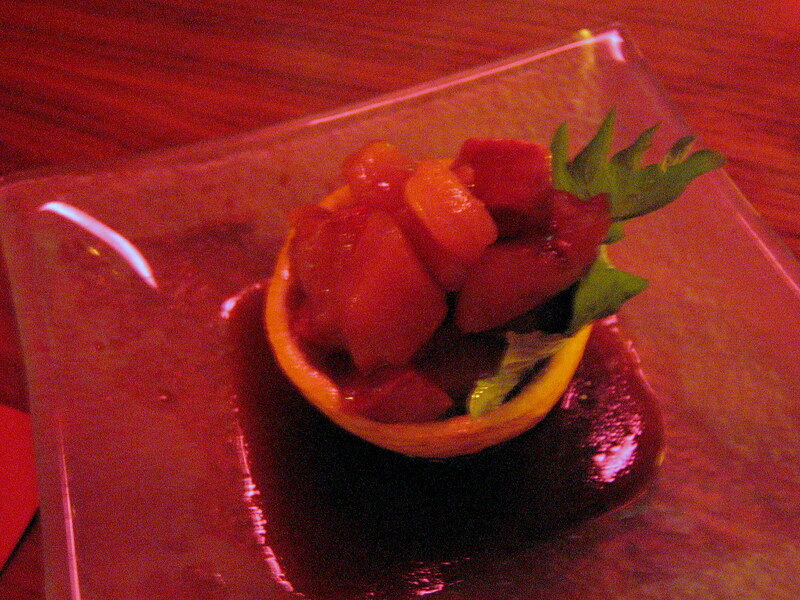 The mousse itself was very weird tasting–it had a very strong musky taste and I couldn’t eat more than two pieces. Fish and Chips was okay… nothing special (It sounded oh-so special on the menu). Shrimp tempura was over-cooked and dry, but the rice was okay. 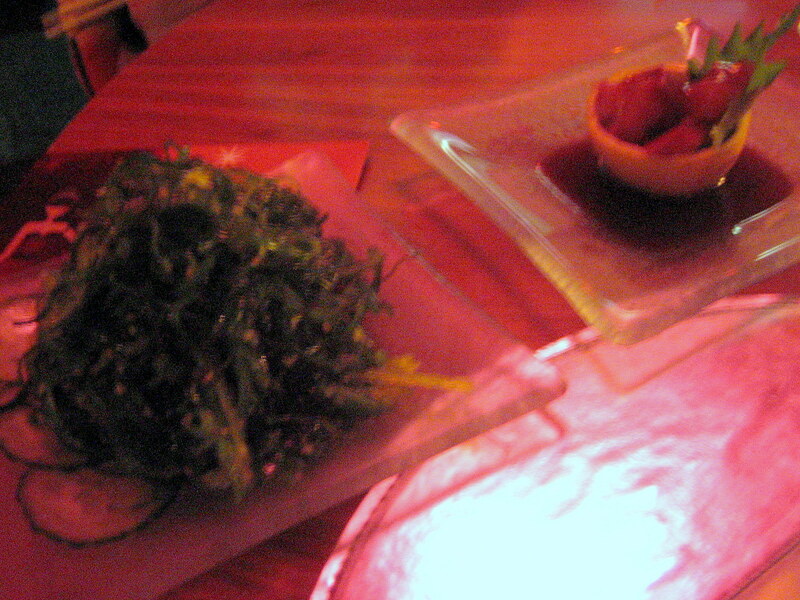 We had Wasabi Guacamoule with fried wonton chips. The wontons broke off if you tried to dip them in the guac, so we had to spread with the spoon. Also, the guac just tasted like avacado, now wasabi whatsoever. Last were the Kobe sliders, medium. Again, nothing special. I wish we would have ordered a different sushi so we didn’t get two kobe items, but it was okay in the end. The bun was very hard, and I didn’t like eating these messy burgers in my dress in the nice dining room. I felt like people were staring at me. Service was ridiculous. Our waitress came by about three times within our first dish arriving, asking us if she could take our soy sauce plates, our napkins, our silverware–she was trying to remove every piece of everything we weren’t using. Also, everytime she came she moved the plates to ‘reorganize’ the table, even if it was a milimeter. Then she disappeared for a while and when our table got cleared, it was like a circus! Three people, from all sides of me were clearing the table–they really wanted us out of there quickly! The thing about service is that you should take it for granted. Excellent service should be seamless and go unnoticed. The fact that I noticed our service was bad means that it was really bad. Also, I’m a big stickler for ‘owning up’ to the language. If you’re going to claim to be Japanese cuisine and use Japanese ingredients and names, then at least spell the menu correctly. I mean, even Dan noticed it and he’s not even versed in Japanese, let alone Japanese ingredients. They butchered “Chichai Sara” and then spelled ingredients like “daikon” incorrectly. One thing can sum up my experience there: *sigh*. I had hoped so much for SEI to be good, especially after their abbreviated review in the Post (how the ostrich leather was supposed to muffle the sounds), but it was everything Oya isn’t. The chairs also have the handles on the back, but have laces up them. 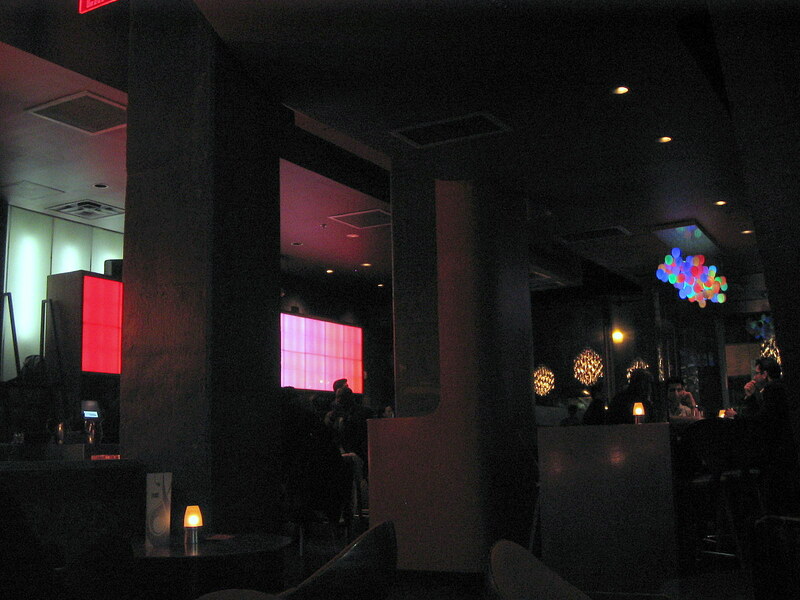 I liked the wall between the lounge and the dining area that was constructed out of red coral, but when you get close to it, you could see that it was really half-assed and the coral was sticking out all over the place at the top. Also, you can’t really see the restaurant from the outside, we had to identify it by the valet sign. They just have indescript symbols on the front of the doors. Tomorrow is my sister’s (belated) birthday party, so I decided to make pumpkin muffins. (I already gave her a birthday present on her real birthday). I just used the Pillsbury Pumpkin Bread mix, but made them muffin style. It was also the first time that I used silicone in the oven! I used a Hello Kitty muffin mold as well as some silicone muffin cups that my mom had given me. Um, turns out that “fill cups 3/4 full” means actually fille 3/4 full, not just-as-long-as-it’s-not-100%-full, because the muffin cups really puffed up and the muffin molds needed TLC after they overflowed onto each other (I had to clean ’em up and re-bake for a few minutes). Here’s the result, I hope she likes them!